Students excavating the entrance of a Middle Bronze Age Roundhouse in 2010. We’re going to use this new blog to tell people about some of the different archaeological sites that can be found on Achill Island and in the surrounding areas of County Mayo. We’ll also be using it to share some of the results of the excavations we are undertaking on Achill, including the ‘Cromlech Tumulus’ on Slievemore and the mysterious ‘Pony Graveyard’ recently discovered on the beach at Dooagh. So watch this space! 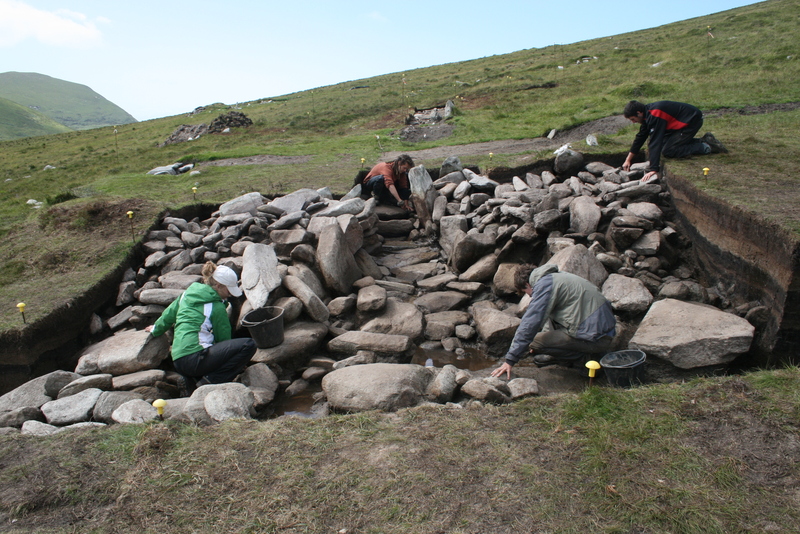 The staff at Achill Archaeological Field School are heavily involved in the Irish Archaeological Community and we’ll certainly be using this blog to share information about the work of our friends and colleagues, and other interesting things that we might come across from time to time. I think a very good place to start, seeing as it is so central to so much of the work of Achill Archaeological Field School, is the mighty mountain of Slievemore. This behemoth dominates the western half of the island, with its dramatic profile and lofty summit. Referring to archaeological landscapes as palimpsests may be a tad clichéd but in this case it really is perfectly appropriate. The earliest archaeological remains on Slievemore are a series of Megalithic tombs dating from the Neolithic period and probably constructed around 3500BC! Today two Court Tombs and a Portal Tomb are clearly visible and several other megalithic sites are present, even if it’s not exactly clear what types of site they represent… yet! During the Bronze Age Slievemore was a farmed landscape and there are numerous large houses, two of which have been partially excavated and found to date to between 1400 and 1200BC. The houses are constructed within an expansive field system which has been surveyed in detail and subject to small scale excavation. As with most of Ireland the Iron Age remains elusive, but we are slowly beginning to put together a complex picture of Medieval Slievemore. Traces of settlement sites, ecclesiastical sites and industrial sites have all been identified but much more work needs to be done on this period before we can properly understand the scope of activity taking place on Slievemore during the period. Superimposed on these early landscapes is a very dense and well developed post Medieval farming landscape. The famous Deserted Village runs along one of the lower contours of the mountain and is accompanied by a complex arrangement of roads, pathways, garden plots and fields. Military activity at the start of the Nineteenth Century is evident in the remains of a Napoleonic Era Signal Tower on the adjacent ridge. Between the signal tower and the end of the Deserted village there is a quartz quarry that was once connected by a tramway to the quay at Gubalennaun Beg on the coast beyond Pollagh. But I think before we get to carried away with all of this we ought to have a look at the physical aspects of Slievemore that underpin the various archaeological landscapes. The geology and environment of Slievemore seem like a very good topic for our second post! 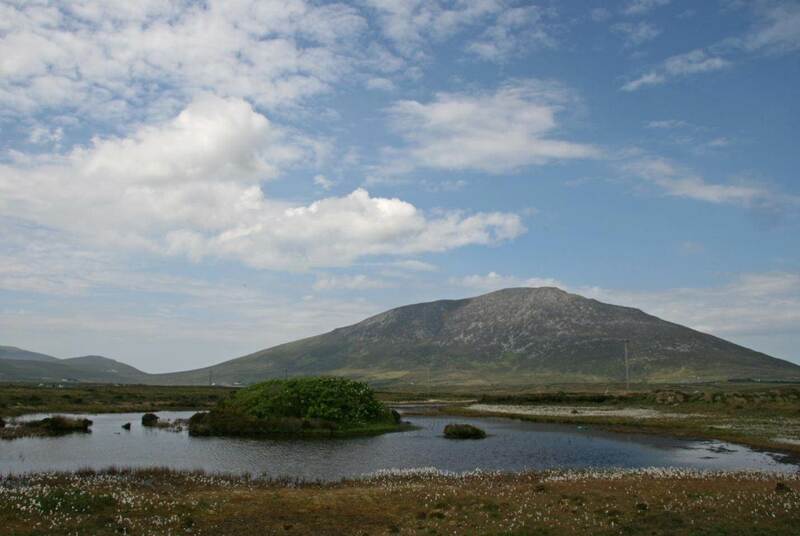 Slievemore, with the small artificial island or Crannóg at Loughannascaddy in the foreground.